Rujak Cingur is a fruit-vegetables salad with spicy sauce. Literally “cingur” means mouth in Javanese. This food has become the unique taste of Surabaya. The flavour is really unique, because it combines of slices of cooked buffalo or beef lips, yam bean (bengkuang), young raw mango, pineapple, cucumber, bean sprout, kangkung ( water convolvulus), lontong (compressed rice), fried tofu and tempe, all served with black sauce made from fried garlic, chillies, a slice of young banana, petis (black fermented shrimp paste) and ground peanuts. 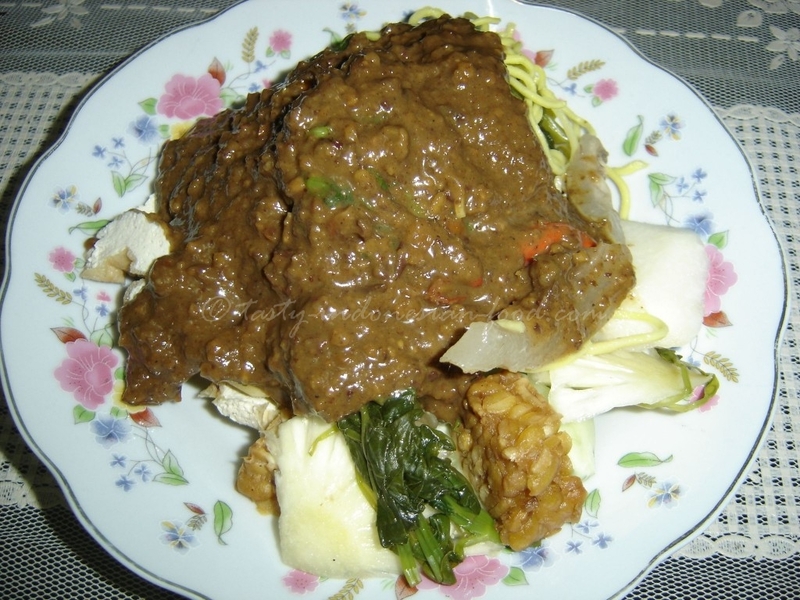 – Lontong (compressed rice), have a look at the Lontong recipe. 1. Clean all the vegetables, then cook. Set aside. 2. Peel and clean all the fruit and then slice into small pieces. Set aside. 3. Prepare the sauce by grind or blend all the ingredients, then add a little of water to make it thicker. 4. Serve: cut lontong into small slices, then arrange it on the plate, add cooked vegetables, the fruits, fried tofu, tempe, cingur (cooked buffalo or beef lips) and then pour with the sauce. Garnish with krupuk udang (prawn cracker).